In 2013 we started the Camino de Santiago in Spain by walking 119 miles (192 km) in 11 days. In 2014 we continued from where we left off and walked another 183 miles (294 km) in 13 days. It’s now time to go back for our third (and hopefully final) time to walk the remaining 183 miles (294 km) and complete the pilgrimage by making it to Santiago de Compostela! Once again, we’ve walked about 200 miles (320 km) in training over the last three months, and once again, our friends Ted and Lisa from Sweden will be joining us. Our gear is mostly the same as last year too, but I have a feeling the rain coats, rain pants, and backpack covers will get a bit more use this year. The first year was a total rain-out, the second year didn’t have a single drop of rain, and now we’re going back into the hills and lush green forests, so we’re prepared for getting a bit wet again this time. And since, for the first time, we actually have an endpoint, we have an actual walking schedule to go with it. We’ve carefully mapped out each of the 14 days and arranged things so that our distance will average around 14 miles (23 km) per day. We know exactly when we’ll be leaving the flat ground of the Meseta (plains) and when we’ll be going over the steep mountains in the region of Galicia. Everything is planned out and should go exactly according to schedule. You’d think that after doing this two previous years we’d have everything figured out now. But each year is a bit different, and the last-minute packing, re-packing, and stressing about each tiny bit of weight never gets easier. Our packs are ready to go though — we have our “Camino passports”, our real passports, and our plane tickets. Plus enough excitement and adrenaline to hopefully make it to Santiago. It’s now T-minus 2 days until we fly to Spain, and it’ll all start up again on Saturday, May 23rd in the tiny town of Villar de Mazarife where we stopped last year — here we go again! Buen Camino, Russell y Kathey! 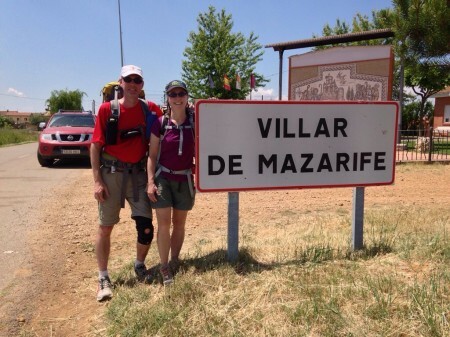 May 23 is the anniversary of my beginning the Camino in 2013. See you on Saturday :-) longing to get started! I read your blog in 2013 and 2014 (when me and my wife also walked Camino in two steps, a little later in july and august), and I was already wondering when you will make your first post this year… :-) We wish you a beautiful walk and we are looking forward to your next posts. Buen Camino! Kathey!! I didn’t get to say bye before you left the office today. :) I’ve been reading your 2013 blogs through the day today as I’ve had a few minutes here and there and I am all caught up in this thing!!!! I can’t wait to get home and read the blogs from your 2014 trip….. and I for sure will be keeping up with the daily blogs from your current trip. I am so excited for you and your husband. I so want to do this!!! I’m Javi Kacy Thompson’s friend in Ponferrada. She told me to contact you because you’re finally going through our city this year. I guess she’s already given you my contact information, so if you want to do so… feel free to do it. Things get a little harder for pilgrims when they get to El Bierzo because of the mountains, so take it easy and enjoy it. The weather forecast for those days is good, maybe too good. It could get a little too warm for walkers.